NEW! Just the thing for the traveling appliance repair trainer or urban repair technician that has minimal space to spare in your vehicle. NEW! 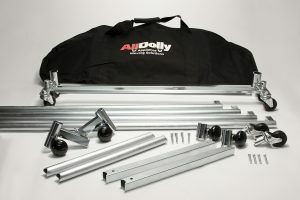 The Updated Standard AllDolly has a fixed width of 31″ and a range of height from 6 1/2″ to 36″ (depending on how you assemble the support beams). It can be used for the removal, support, repair and re-installation of most built in appliances, particularly Ovens, and can be used to service most other appliances too. With the Accessory shelf it can be used as an adjustable height work table which can be easily fold and stored against a wall or hung up on hooks. Can be disassembled and stored in either the optional Storage Bag or hard Case (both sold separately in the Accessories section). Weighs just about 25 lbs. I want to thank you for such a great product. Earlier this year I purchased the standard break down model. It has been a real time saver as well as a back saver. Again thanks for a Great product! The wall oven dolly I bought from you is great! When working on built-in wall ovens we utilize the AllDolly to safely pull out the oven for service. Our goal is to always work safely around larger appliances and sometimes given certain repairs or installations we will utilize two technicians. Again the goal is to be safe to avoid injury or property damage. Went on a service call the other day on a Thermador electric wall oven; complaint – no bake. Now, wall ovens can be tricky to troubleshoot and repair so I came ready for the worst-case scenario which would require me to remove the wall oven. I packed my AllDolly wall oven cart in my Fixite Do service van and off I went. I own an AllDolly for removing ovens from walls to service for my business Goodmans Appliance Repair in Colorado. This tool is worth its weight in gold. Invaluable to own, pays for itself, very professional when you take it into a customers home. Buy one today. dolly fleet. You will not be disappointed.